Christian worship joyfully ascribes all praise and honor, glory and power to the Triune God. In worship we acknowledge God present in the world and our lives. As we respond to God’s claim and redemptive action in Jesus Christ, believers are transformed and renewed. In worship, we offer ourselves to God and are equipped for God’s service in the world. Worship is important to God; thus it is important to us. Indeed, it is the most distinctive act among Christians, and it is our most selfless act. Worship is the primary way we express our love for God. We recognize that people enjoy worshipping God in different ways. Therefore, we offer two distinct worship services. Our contemporary worship features contemporary music, with occasional hymns, led by our Grace through Faith (GTF) praise band. The feel of the service is casual, celebrative, and non-traditional. The message is the same at both services. Our traditional worship is also celebrative, but also more classical and formal. Music is led mainly by our sanctuary choir; at times we include our bell choir, youth and children’s choirs. We are blessed by the use of our pipe organ, grand piano, and a variety of other musical instruments. 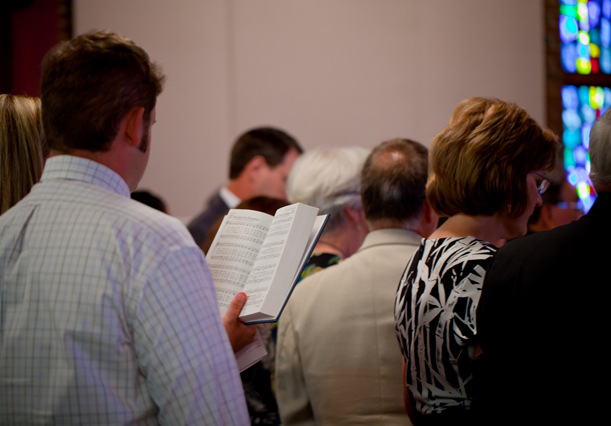 This casual service includes congregational singing, a brief message, and communion. We believe that our Sabbath worship propels us into a whole week of daily worship. We encourage disciples of Jesus Christ to live in God’s presence through daily devotions, including Scripture and prayer. In addition, we express our love of God through our obedience to God’s commands.